Foran’s Umer Khan tries to break the grip of Daniel Hand’s Alex Dube on Wednesday, Jan. 17, 2018 in Madison, Conn.
Foran coach Dave Esposito didn’t just have a hole at 152 pounds when he looked to fill out his lineup card for the season, he had a mammoth one. That’s what happens when one of the best grapplers in state history graduates and heads off to college. But it hasn’t hurt the Lions’ production in the slightest. 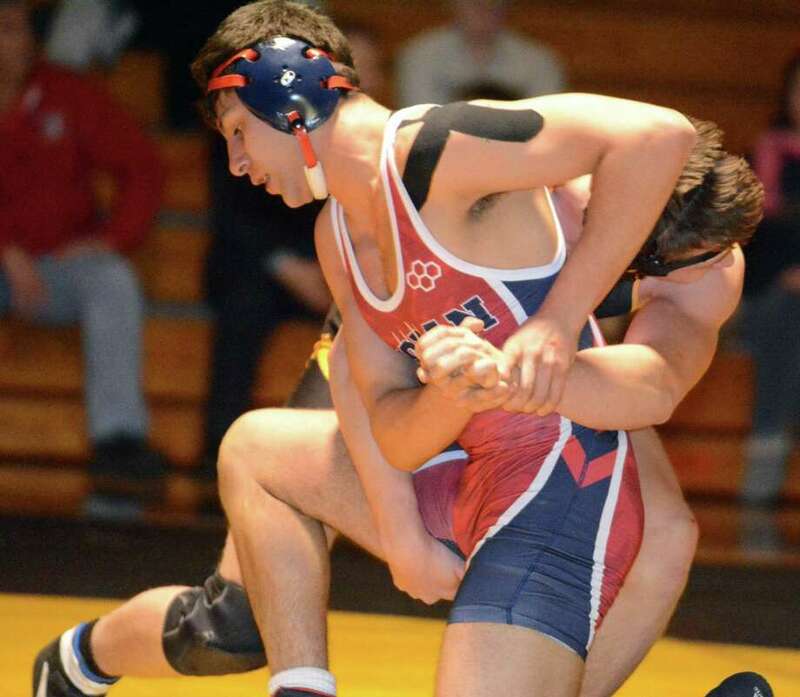 Foran has a 24-2 record and sits firmly inside the top 10 of the latest CTWrestling.com State Poll at No. 7. The defending Class M champions have weathered the loss of defending State Open champion Ryan Luth to put out another solid lineup capable of competing for hardware again. The Lions have finished first or second in Class M in the last four seasons, bringing home two crowns. Depth is the formula that hasn’t changed for Esposito, who intentionally loads the meet schedule to get his kids as many matches as possible. The 24 wins is the most in the state so far. The upper classes is where Foran shines. Nolan Bannon (195) and Umer Khan (170) each boast 26-1 records while Pat Brogan (182) is 24-2. Several other standouts — including Michael Giordano and K.J. Pokornowski — have more than 20 wins. The highest ranked SCC team in the state, the Lions hope to compete for that trophy. Xavier has won the SCC the past two seasons. The two sides meet in the season finale Feb. 6. Danbury senior Ryan Jack added another title to his impressive résumé last week by taking down the Eastern States Classic, held last weekend at Sullivan Community College in New York. Jack won a close 5-4 decision over Pennsylvania’s Zeke Escalera. Jack went 5-0 to win the title at 126 pounds; the Hatters took fourth as a team. Teammate Kyle Fields took fourth at 132. New Canaan’s Tyler Sung also won a championship, winning the 145-pound title by beating Jonathan Spadafora of Long Island in a 3-2 decision. No. 1 Danbury stayed atop the state poll with its performance in New York, and added another FCIAC win by beating No. 8 Trumbull 49-23 on Wednesday. Joseph Palmieri (182), Matt Ryan (138) Michael Longo (106) and Travis Longo (113) earned wins for the Eagles while the Hatters swept the rest. The Eagles slipped from fifth to eighth in the poll after Middletown notched an impressive 43-30 win in a quad meet at Guilford last Friday. The win for the Blue Dragons vaulted them from No. 10 to No. 6 in the voting. Danbury and No. 2 Bristol Eastern are still undefeated at the midway point of the season, to the surprise of few. Several others across the state — including Newtown, New Milford and No. 10 Avon — have yet to lose in dual meets. Colter Abely Midseason Classic at Xavier: The Falcons welcome several top-10 squads, including Bristol Eastern and Warde. Eagle Classic, Saturday at East Catholic High School: Newtown won the competition a year ago and will compete against more than 10 schools from across the state. Danbury at Mt. Anthony, Monday, 5 p.m.: Hatters will venture to Southern Vermont to take on the squad that edged the Hatters for second at New Englands last winter. East Haven at Xavier, Wednesday, 7 p.m.: The Yellow Jackets sit at 14-3 after toppling Fairfield Prep; Falcons were No. 9 in the latest state poll.